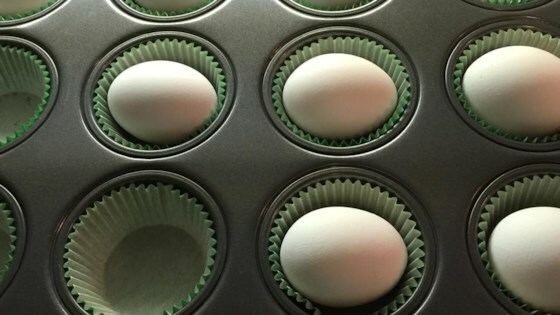 "This is an easy alternative to boiling when you need to make a lot of eggs at once. Red dots may appear on the shells and a little on the whites, but you can cut away those parts. The eggs still taste great." If your oven runs hot, you may need to reduce the temperature to 325 degrees F (165 degrees C). Just tried this recipe and they came out great. I put a little crumpled up foil in the bottom of the tin and rested the eggs on top making sure they didn't touch the sides and no brown spots!